An effort began Tuesday in San Francisco to prevent a repeat here following the controversial removal of a passenger from a United Airlines plane. SAN FRANCISCO (KGO) -- An effort began Tuesday in San Francisco to prevent a repeat here following the controversial removal of a passenger from a United Airlines plane. San Francisco Supervisor Jeff Sheehy wants the city attorney to look into drafting an ordinance that would prevent San Francisco police from doing the same. "I don't think these incidents where people are pulled off planes are appropriate and I don't think our police department should be cooperating with that," he said. "The family of Dr. Dao wants the world to know that they are very appreciative of the outpouring of prayers, concern and support they have received. Currently, they are focused only on Dr. Dao's medical care and treatment." Both attorneys say that until Dao is released from the hospital, the family is asking for privacy and will not be making any statements to the media. Chicago aviation security officers removed Dao from the flight to Louisville Sunday to make room for crewmembers who had to get to another flight. United CEO Oscar Munoz sent an email to employees Tuesday saying "No one should ever be mistreated this way." He also said the airline will work to make it right. 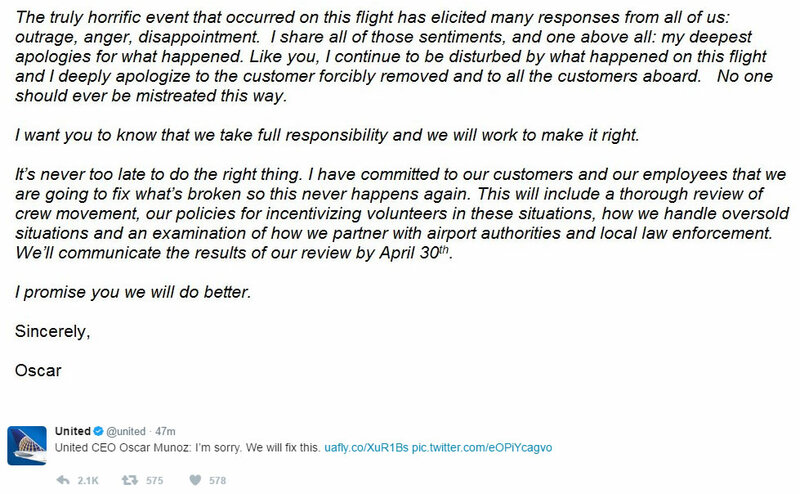 United Airlines CEO Oscar Munoz issued an apology on Twitter on Tuesday, April 11, 2017. Munoz' full apology was tweeted by United on Tuesday.